The pygmy mammoth was found fully preserved, buried underneath the ice on Kotelny Island in an Arctic area of Russia. Scientists believe this is an entirely new species of mammoth that until now hasn't been proven to exist. Scientists have discovered relics of Mammuthus exilis, or what they’re calling a “Golden mammoth”, named after the color of its seemingly strawberry blonde colored hair. The discovery of the carcass proves the existence of a miniature or “dwarf” species of woolly mammoth — something that’s never been seen by scientists before. The remains of this “Golden mammoth” was about two meters (or about six and a half feet) in height, which is extremely small when compared to a typical woolly mammoth that were on average three meters (or around ten feet) tall. The mammoth was found on Kotelny island in the Siberian region of Russia. Scientists have heard reports of smaller mammoths being found in this particular area before, but the discovery of this carcass solidified their existence. Dr. Protopopov working on Kotelny Island. Scientists have more to figure out, namely whether the discovery of the animal is a one-off or if mini woolly mammoths were specific to the region where the carcass was found. The bones of what scientists believe were pygmy-sized woolly mammoths have been discovered in the Arctic region of Russia, but Dr. Protopopov believes that this “Golden mammoth” is a entirely new species of pygmy mammoth. He believes that this species roamed the earth earlier and was not an rare breed, but an evolutionary adaptation specific to the location where it was found. 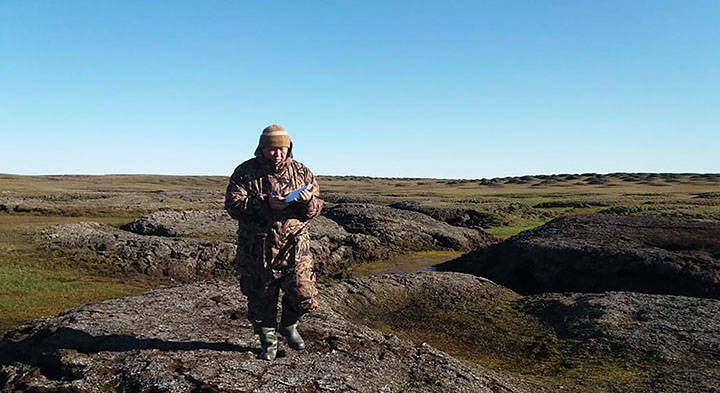 Dr. Protopopov was joined by a team of “palaeontologists, archeologists, zoologists, botanists, entomologists and permafrost experts” on this expedition to Kotelny Island where the “golden mammoth” was discovered. Where the new species of woolly mammoth was discovered makes this find all the more interesting. Koletny island, as well as much of the Russian Arctic region of Siberia, is completely frozen in the winter — including the sea. 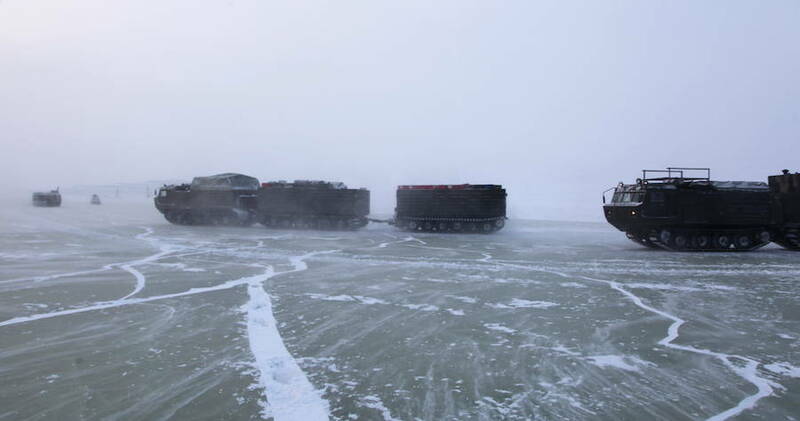 An Arctic expedition undertaken by Russia’s Defence Ministry on Kotelny island. 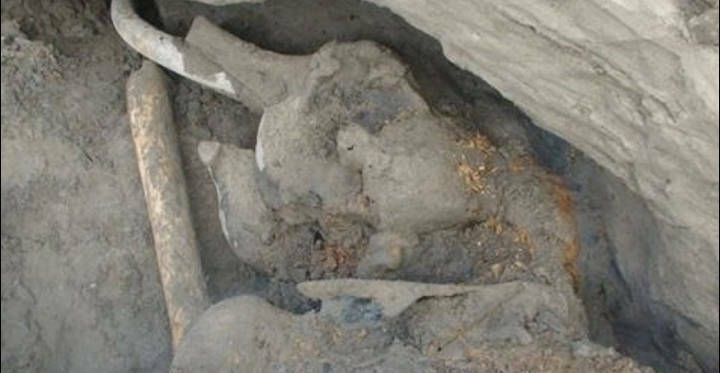 The mammoth was found in what Dr. Protopopov describes as “an inaccessible place, and is almost completely buried in the ground in a tidal area,” making this discovery particularly remarkable. Europe has been experiencing one of the hottest summer’s of record, and the extreme temperatures could have enabled the ice to melt enough to make this discovery possible. It’s a find that has scientists extremely excited, and it’s quite possible that they have the unusually hot 2018 summer season to thank for that. Excavation of the “Golden Mammoth” has been set to start in the summer of 2019, and it’s likely that scientists will be able to find more animals that have been as well preserved underneath the ice as this latest discovery.